chop the leek (for those of you unfamiliar with leeks, you should not eat the leaves, chop them off and put them in your compost bin), potatoes and onion and add to a large heated saucepan with the olive oil. 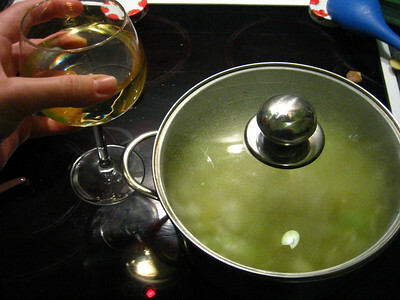 when slightly browned add a half cup to a cup of dry white wine. add vegetable bouillon mixed with a few cups of boiling water to the pot. add salt and pepper to taste. 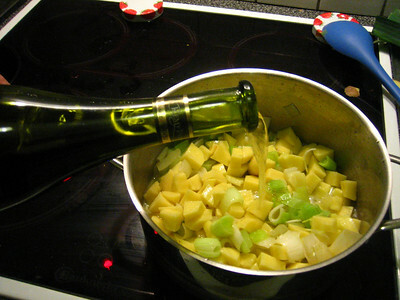 pour yourself a glass of the wine and let the soup simmer for 20 to 30 minutes. 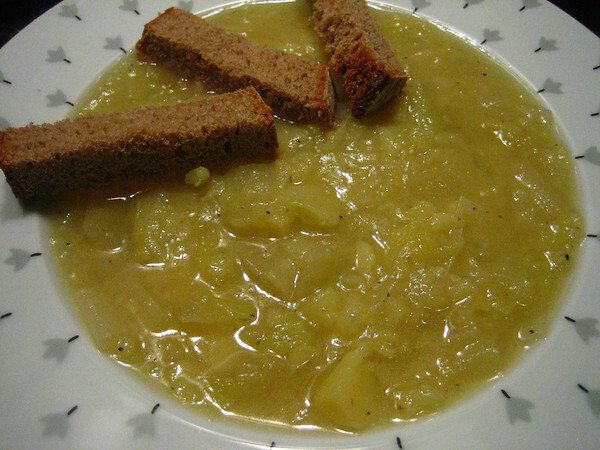 when potatoes are tender, use a hand blender to process the soup, but leave some parts chunky. 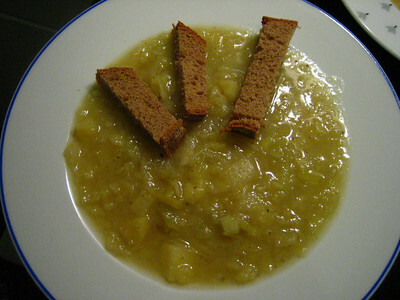 serve with toasted Krustenbrot (aka crusty wheat bread for those of you outside Deutschland) or croutons. bon app! (bon app is the french diminutive of Bon Appétit, aka good appetite aka enjoy your meal). This entry was posted	on Monday, October 15th, 2007 at 21:45	and is filed under food. You can follow any responses to this entry through the RSS 2.0 feed. You can leave a response, or trackback from your own site.